Velocity is aggressively going after membership growth with a new promotion that (unfortunately) seems to be targeted at different levels to some members. 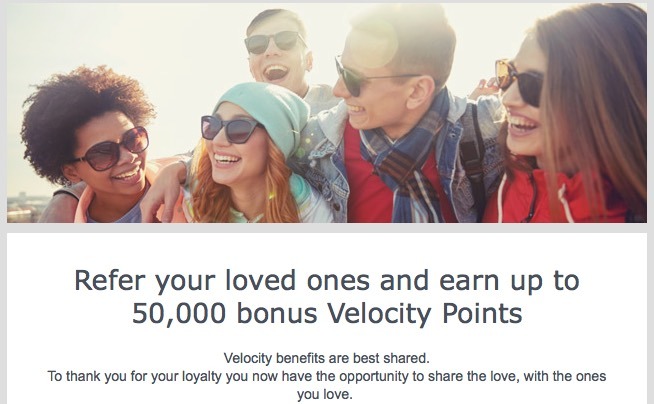 At the top end, it seems that quite a few existing Velocity members can refer up to 10 new members for 5,000 points each to the referrer. Each new member will also earn 1,000 bonus points, with the only caveat that they will need to earn some points into their account by June 30 to trigger both bonuses. Other flavours of the offer are floating around as well, with 1,000 and 2,000 point offers also coming through – and not everyone is receiving the deal either. I don’t usually write about targeted promotions much given they are only useful to some people – but this one does seems to be quite widely available in different forms, so check your inboxes to see what Velocity might be offering you. There are quite a few ways that new members can earn points by the June 30th deadline to trigger both bonuses. I’d argue that the simplest way to do this is to have the new member sign up (or with their permission, doing it for them) and wait for their membership card to arrive before using it at BP for a purchase – a newspaper or chocolate bar would do the trick. Points from BP usually credit fairly quickly to Velocity accounts. Velocity also mention a booking from OpenTable as being an eligible earn activity as well. The Velocity eStore would also be a simple way to pick up some additional points, but I feel that there’s some risk in relying on this as the time taken for points to credit can be fairly lengthy. The new member could of course take a flight or perform any other earn activity, excluding a family pool or family transfer which would not trigger the bonus. If the new member is a legitimate family member you could look to combine their balances in future by using family transfers – but they would need to earn over 5,000 points in their account before doing so. Family pooling for new members of your household would be a more effective option to make these bonus points into a usable balance, but in both transfer and pooling cases they should be a valid family member – have a read of the Velocity family pooling / family transfer guide for more on this. Summing up – this is an easy promotion to pick up some bonus points and get your friends and family involved in Velocity. Promotions like this that seem to be target quite randomly make me once again question my “loyalty”. With some reds receiving the offer and some higher status members not, it seems that the promo could actually to do some harm to their loyalty.